Discussion in 'Online Casino Reviews' started by Kotsy, Feb 27, 2012. 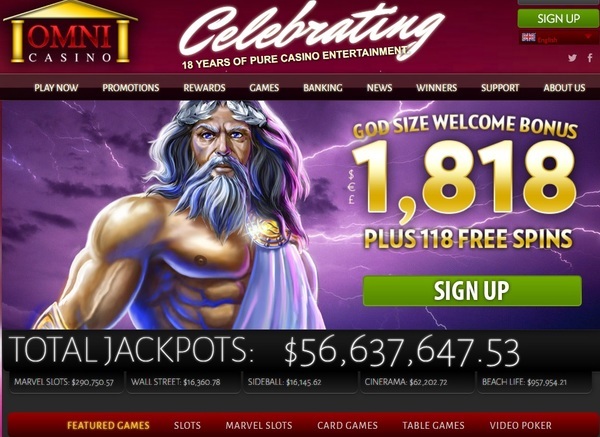 Omni Casino was first established in November 1997 under a different software platform. In 1999 they converted over to Playtech Gaming Software. With all those years of experience, this Playtech powered casino has become one of the favorite Playtech Casinos amongst online players. table games, scratch cards and some great Slot games such as, Iron Man 2, The Mummy, Rocky, Sparta and don't forget about the Progressive Jackpots. Also look for special bonuses based on days of the week or deposit methods. Check the FAQ's first to see if your answer is there. If not, they are available 24/7. Although online chat is not always available, you can email or use the telephone numbers for your region what you can find on their website. Omni Casino is one Playtech Casino that is worth your time. Enjoy playing some of the best games out there. Welcome Bonus have been updated from Omni Casino. €1818 + 118 Free Spins. First deposit bonus is a 180% match bonus up to €180 + 18 Free Spins. 50% up to €300 + 50 Free Spins on your second deposit. 200% up to €300 + 15 Free spins on your 3rd deposit. 50% up to €258 + 14 Free Spins on your 4th deposit. 300% up to €600 + 20 Free Spins on your 5th deposit.